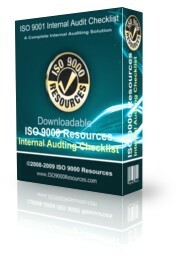 ISO 9000 Resources offers 3 levels of internal auditing packages based on our proven audit checklist system. The audit checklist is designed to address every requirement of the standards. In fact, you may not need a copy of the ISO standard since the checklist addresses each line of standard and converts it into an easily understood question. All our packages include the integrated checklist in native format (Microsoft Word) so it can be easily customized. The checklist is designed to maximize results by getting the most out of every auditor. The in-depth questions allow auditors to focus on documenting the status of the quality system and not on grasping the verbiage used in the ISO standard. The checklist gives your internal auditors focus while allowing then to dig deep and uncover any weaknesses in your quality system. All our internal auditing packages are designed to make every audit effective AND efficient. By combining our checklist system with other auditing documentation, we allow companies to get their internal auditing program started in hours, not weeks. In addition to the checklist, you will receive an electronic copy of a sample Internal Audit Procedure, sample internal audit plan, internal audit checksheets, Gap Analysis with Guide, and our ISO 9001 Startup Guide. This package includes a more complete and usable version of the Internal Auditing Checklist shown on this site. With this package, you will receive a key to the ISO 9000 Resources download center so you can get access to the files the native format (Microsoft Word). This package include an internal auditing procedure and and audit scheduling tool. The checklist questions are phrased so that even novice auditors can get professional results. All our products and services come with a 30 day, 100% money back guarantee. If you are not satisfied for any reason, your purchase price will be returned!